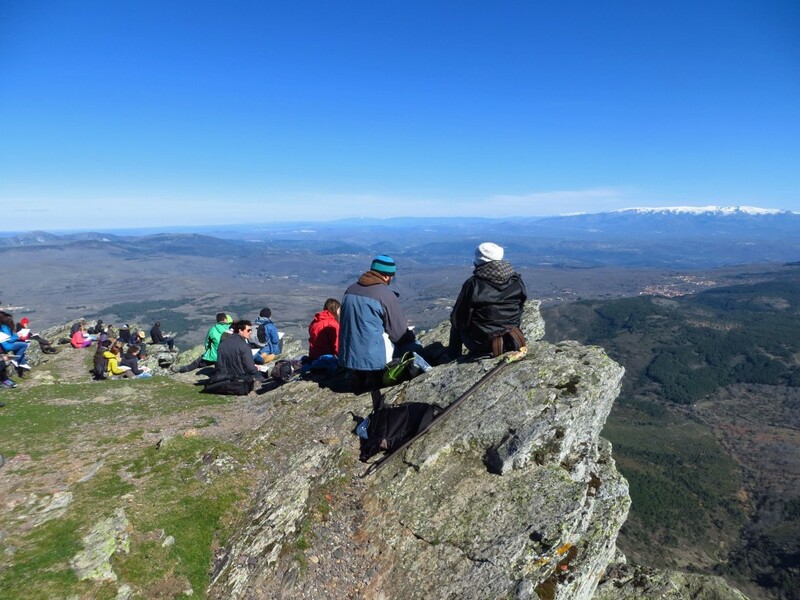 35 students and 15 lecturers from universities in Bulgaria, Croatia, Portugal, Spain, Sweden and the Netherlands took part in the second edition of the ‘European Wilderness Entrepreneurship’ school from 20/3 to 4/4, a part of the Erasmus Intensive Programme. Indulging in a unique learning experience in Western Iberia. Many participants were very eager to step outside the theoretical walls of lecture halls and literature, which is both a stimulus and a challenge. Each place has its own unique history, its relation to the landscape and its valuable bank of practices and experiences. The setting turned out to be a positive surprise for all; Iva Dujic from University of Zadar in Croatia describes the programme as a beautiful experience for anyone who enjoy nature, who love to meet new people and who are open to new experiences. The extraordinary cultural and natural heritage of the region was clearly inspirational to all participants, who shared their newly discovered fondness for the region with the residents. This in turn reinforced the feeling among residents and stakeholders that this large group of foreign students shared their concerns and tried to find out effective plans for a sustainable future in the area. Of course, as in any such programme, there were challenges, especially in the initial phases. In retrospect, Sérgio Miguel from Aveiro University in Portugal adds “it is important to step outside our usual environment to meet new knowledge and take part in new adventures”. So what did we meet from the biodiversity and natural heritage of the area? Here is a complete list from Atanas Grozdanov, a lecturer and ornithologist from the Sofia University, Bulgaria. As our trip started with lectures in Salamanca, we had the opportunities to watch birds living in the urban environment: white stork, wood pigeon, greenfinch, black redstart, spotless starling and kestrel. 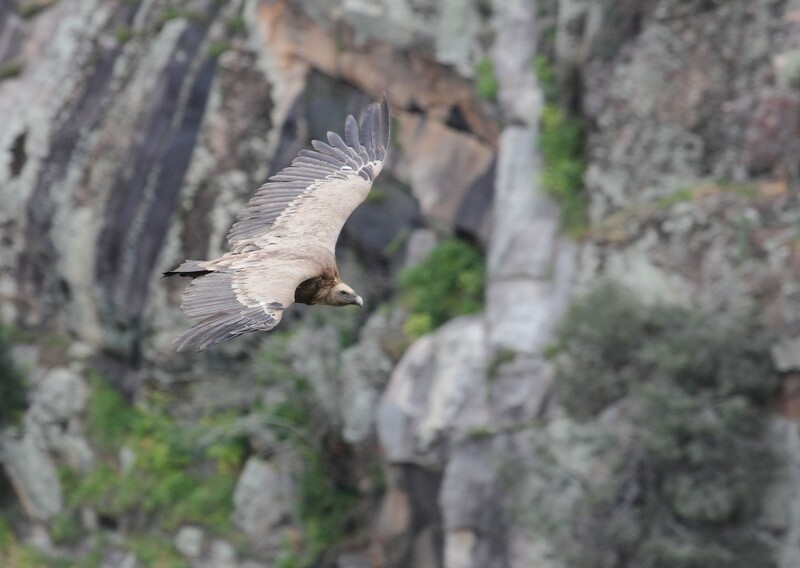 During the travel westwards, to the village La Alberca, many birds of prey were encountered soaring over the typical dehesa landscape: griffon and black vultures, black and red kites. In the vicinity of La Alberca where we stayed most of the time, the vultures were still present as well as mountain and forest species like blackbird, nuthatch, wren, blackcap, robin and greenfinch. As the altitude and the habitat changed when we visited the mountain top Peña de Francia, we observed some new species: blue rock thrush, rock bunting, raven, golden eagle, the first Egyptian vultures and we also were lucky to meet the reintroduced, and typical for the region, Spanish ibex. 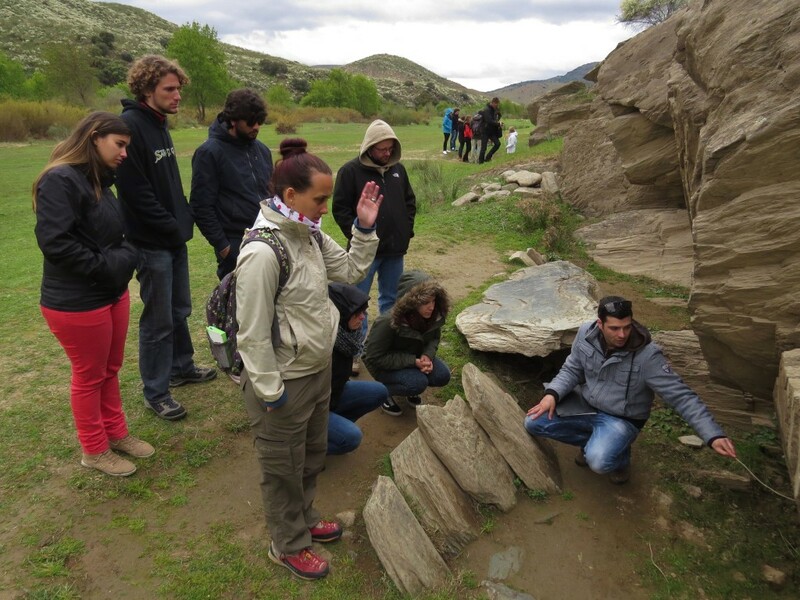 A very interesting day for our wildlife experience was when we visited Rewilding Europe’s site Campanarios de Azaba. The typical blue-winged magpies were there, as well as many griffon and black vultures, attracted by the artificial feeding site, designed also for visiting wildlife photographers. The Black stork was also observed here for the first time during the trip. When we travelled to Portugal the list of animal species was extended. In the surrounding of Figueira de Castelo Rodrigo we observed the elusive Bonelli’s Eagle, blue-winged magpie, subalpine warbler, Iberian grey shrike, and blackcap. In the Faia Brava reserve we had many vulture observations, including some new raptors: booted eagle and short-toed eagle. We also found a great variety of warblers characteristic for the Mediterranean, such as subalpine, Dartford’s and Sardinian warblers. Singing spring species were also there: cuckoo, corn bunting, and serin. The observation of these species helped the group of lecturers and students better realize the rich biodiversity of this area – one of the most important factors for sustainable business plans for Rewilding Europe, which were designed during this Intensive Programme on ‘European Wilderness Entrepreneurship’. This year students and lecturers came from the following institutions: Lund University (Sweden), University of Zadar (Croatia), Van Hall Larenstein University of Applied Sciences (the Netherlands), Wageningen University (the Netherlands), Sofia University (Bulgaria), University of Aveiro (Portugal), University of Santiago de Compostela (Spain) and University of Salamanca (Spain). The first two days of the IP were hosted by the University of Salamanca. 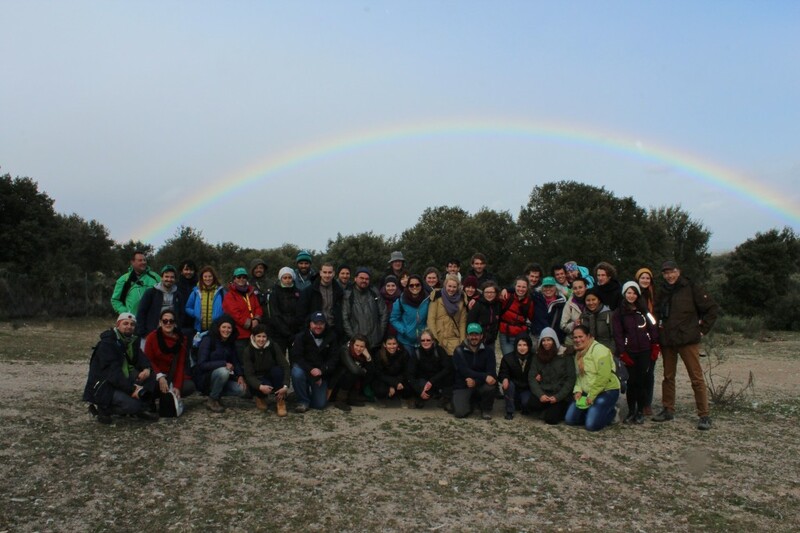 This programme was organized in cooperation with the local Rewilding Europe’s partners Fundación Naturaleza y Hombre (Spain) and Associação Transhumância e Natureza (Portugal) and the Biosphere Reserve (Spain) to whom we are grateful for their support throughout the programme. Funding from the EU Lifelong Learning Programme partially supported our travel, food, lodging and some organisational expenses. For more information, media and student output, please, see the website of Van Hall Larenstein University of Applied Sciences, the lead partner of the second edition of the Erasmus Intensive Programme “European Wilderness Entrepreneurship”.